Standard Incandescent yellow bug lights, with the added benefit of longer life.BULBRITE is a leading manufacturer and supplier of innovative, energy-efficient light source solutions. Founded nearly 40 years ago, BULBRITE is a family owned business renowned for its commitment to innovation, education and new technology. The company has introduced many innovative and design award-winning products, including its exclusive KX-2000, Dark Sky, Purify 02, and Halogen R111 GU10, as well as the 2012 EISA-compliant Halogen A19 and TURBO LEDs. 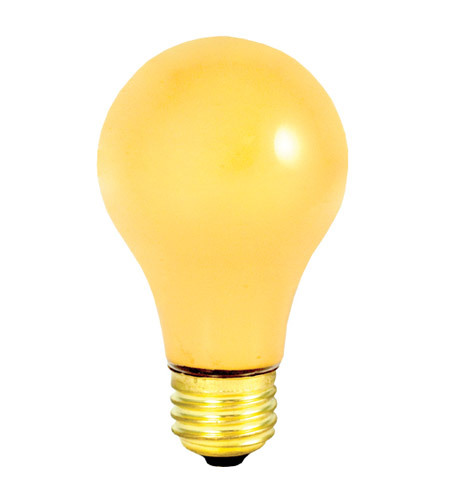 BULBRITE offers an extensive line of light bulbs and lamping options including LEDs, HID, Compact Fluorescents, Fluorescents, Halogens, Krypton/Xenon, Incandescent, and a broad range of specialty lamps.